Carrera Champion sunglasses ($120); A.P.C. 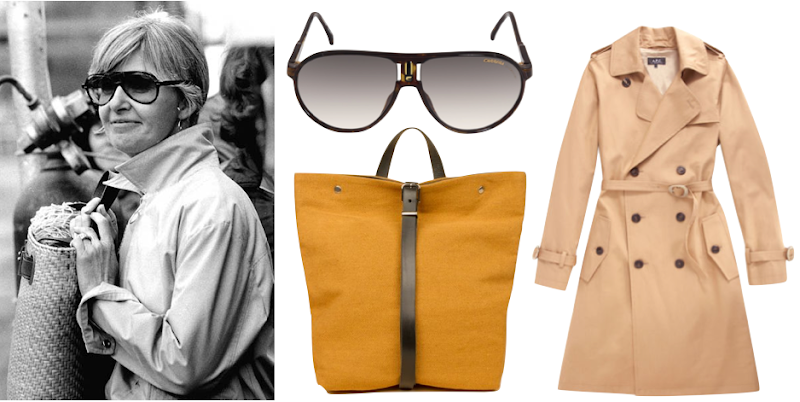 Short Trench ($575); Steve Mono Jimmy 2 Handbag ($415). P.S. I'm glad I'm not the only one sharing sunglasses with my husband. I love her style! Thanks for the post..the sunglasses are great. The J.Crew trench seems like a great option, but I just haven't seen it in person yet. Looks great online! Thanks for putting up a face that isn't in the 20-30 age range! ha! nope - I totally stole my husband's aviators.